There are a lot of great things to do when you are cruising at sea! When it is a port day, we are often out at excursions so enjoy less of the things the ship offers. But when it is a sea day, we are always excited to see what we might enjoy. We always enjoy cooking demonstrations. The cooks make it fun and educational. 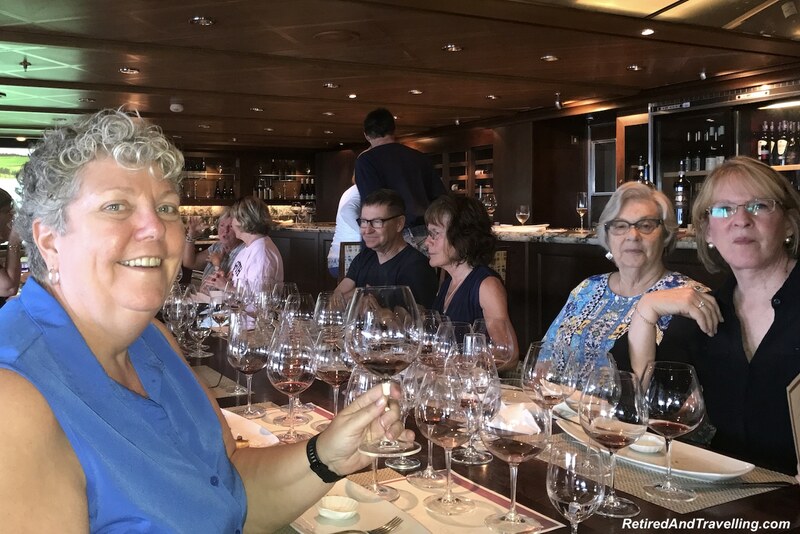 On this trans-Atlantic cruise, we decided to try a session on Italian wine tasting at sea. We often go in search of wine tasting excursions when we are travelling. 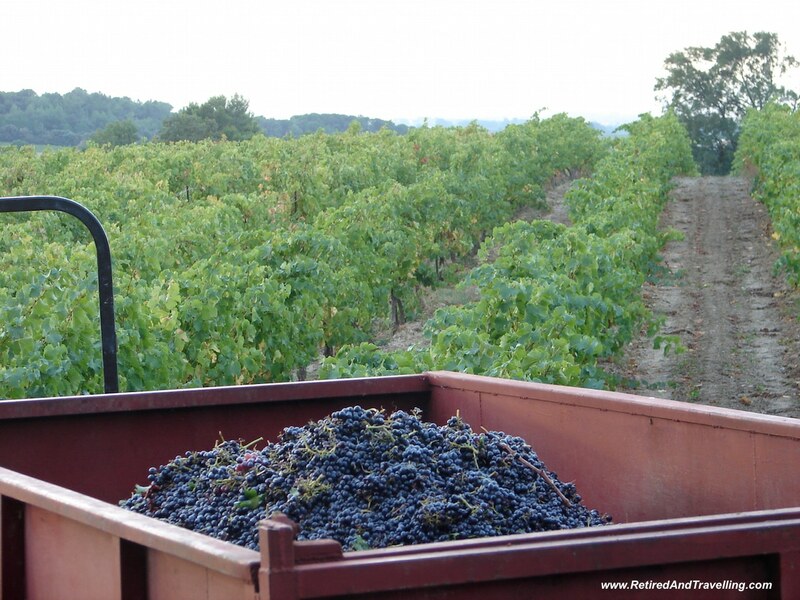 We have stayed in French wine country at harvest season and toured the small co-ops. 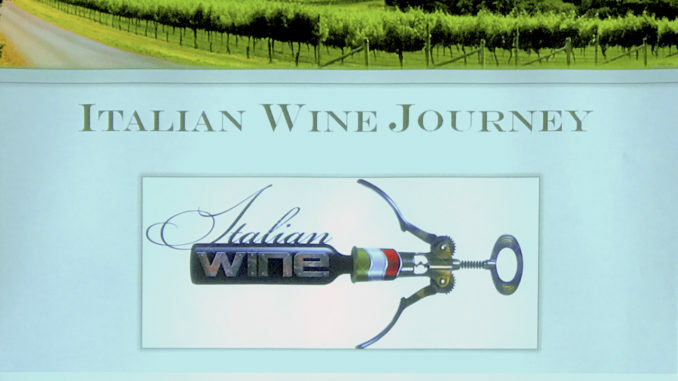 When visiting Italy, we tried the wines in the Piedmont area around Lake Garda. 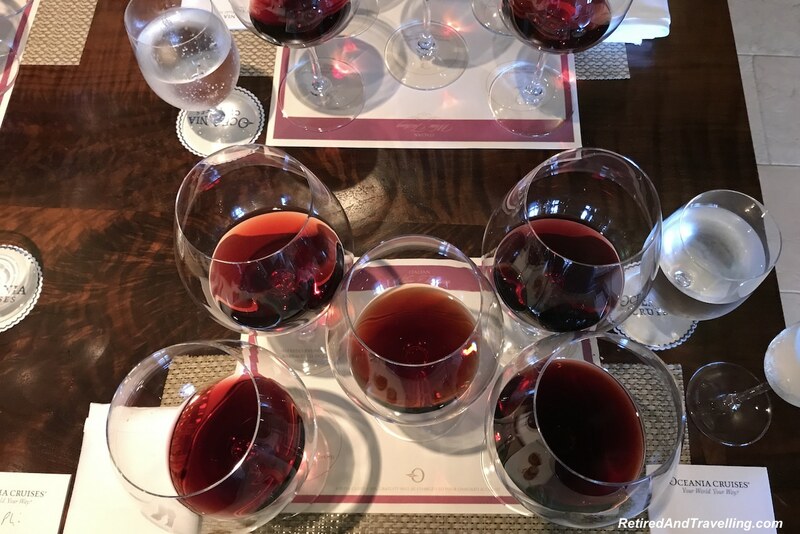 No trip to California is complete without wine tasting in Napa Valley! 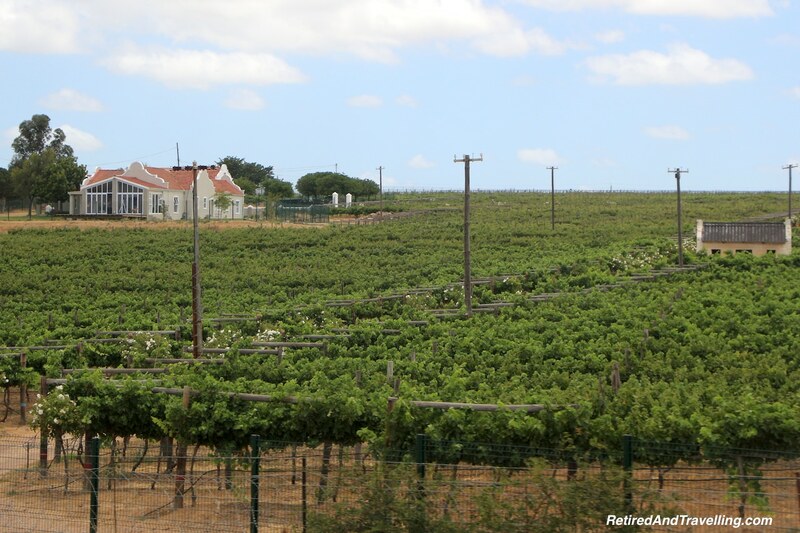 On our recent trip to South Africa, we explored the Stellenbosch wine region. 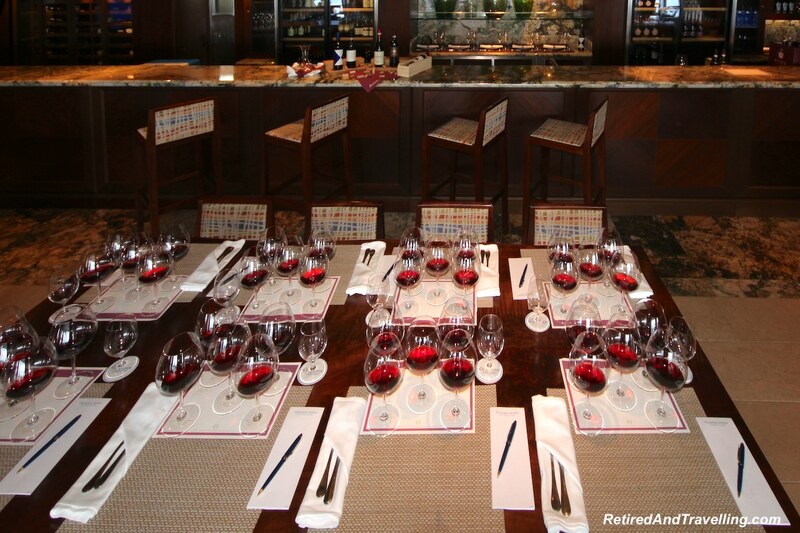 Oceania Cruises offers a variety of different wine tasting events. David is not a red wine fan so I thought I might see if expensive red wines would tempt him. 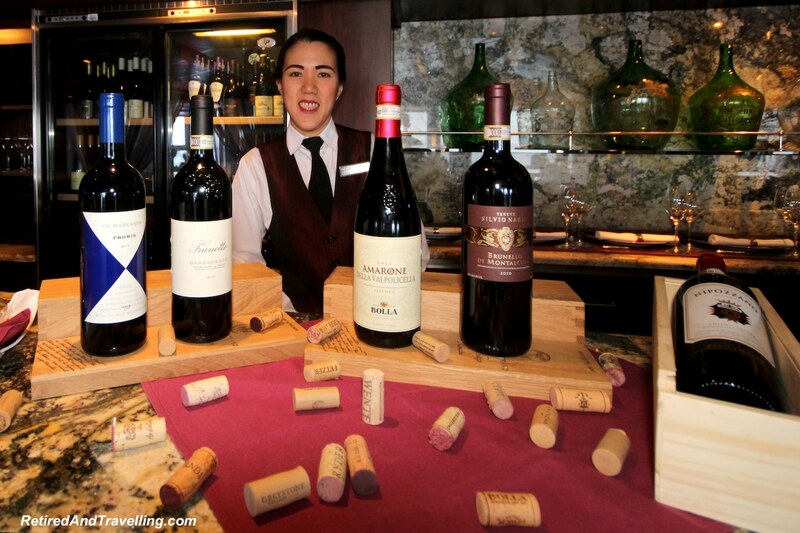 The Italian wine tasting at sea would be the perfect opportunity to try a good selection of red wines. If we found one we liked, we would then hope that there was a wine sale onboard the ship that would let us stock up! On this trip we were on the bigger of the Oceania Cruises ships. Marina holds 1,250 passengers. There are a number of rooms set aside for special events. We had an onboard artist and photographer that offered classes. 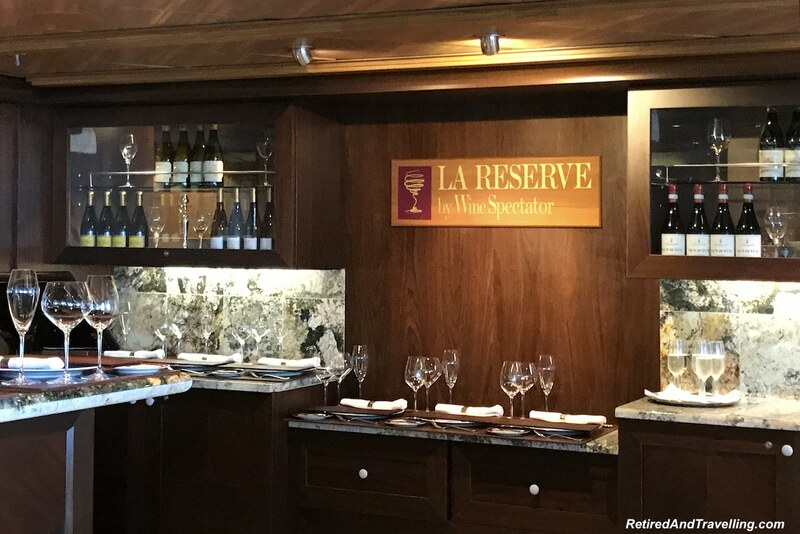 La Reserve provided a room with 3 tables seating 24 people plus seats at the bar. Tasting menu dinners were offered in this room at an additional cost. The wine tasting sessions were also held here. At each place, we found 5 different red wines to try. With the wines we found 5 different food pairings, one matched for each of the wines. There was a large screen that the head sommelier Nidheesh used to provide a little information on Italian wines through the session. We learned that Italy is still the largest and oldest wine producing country. Wine grapes can be found in almost every region in Italy. Italian wines originated in Sicily. 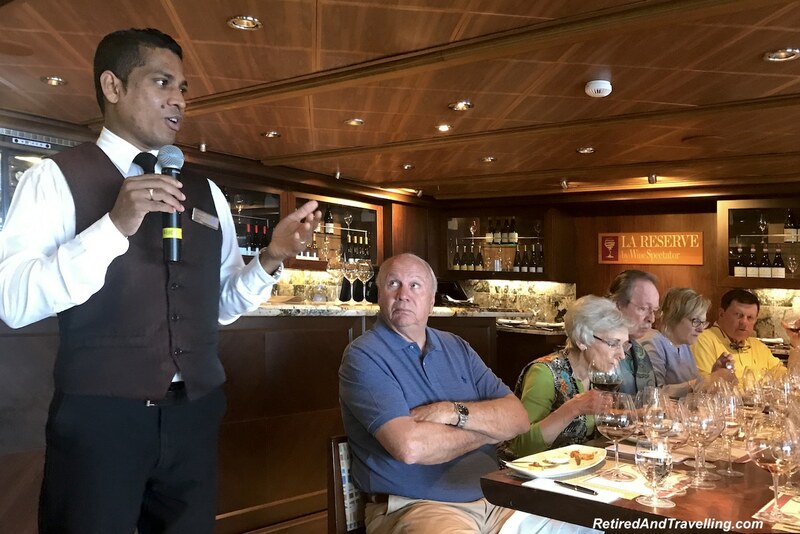 Nidheesh provided an overview of several of the more popular wine regions in Italy, focusing on the regions we would try at our Italian wine tasting at sea. The Veneto region is known for its Prosecco, Soave, Amaraone, Valpolicella and Bardonlino wines. In contrast, it is also known as the birthplace of the Bellini cocktail. The Piedmont area is famous for the Barolo and Barbaresco wines. The Tuscany region is known for more traditional wines such as Chianti and Brunello de Montalcino. David had hoped we would get to try the Vin Santo sweet dessert wine from Tuscany. But we would need to try that in the Italian restaurant. We also learned a bit about the Super Tuscan wines. These are made without Sangiovese grapes. As a result, they are smoother and fruitier. We got a glass of prosecco when we entered. 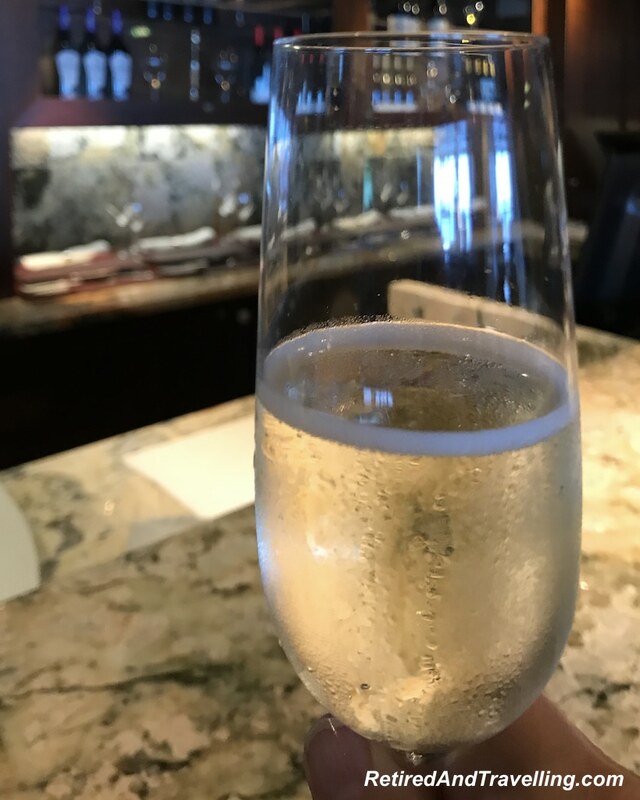 This Italian champagne would clear our palette. Water was provided to cleanse between tastings. We tried 5 different Italian wines. They ranged from a light tasting wine that went with everything to much heavier reds that paired with rich foods. For each wine, we first smelled the wine and checked out the colour. 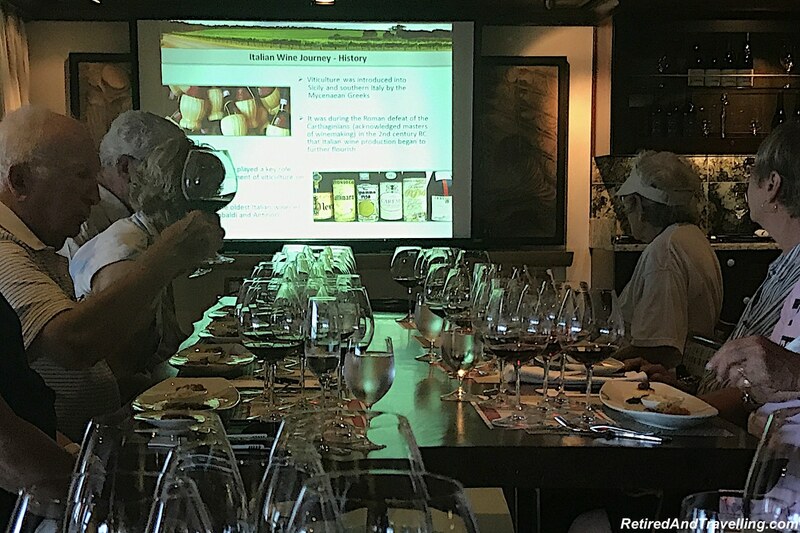 While we did not always distinguish the different fruits, it was certainly easy to smell the difference when we hit the earthy wines. There was a different food pairing with each of the wines. 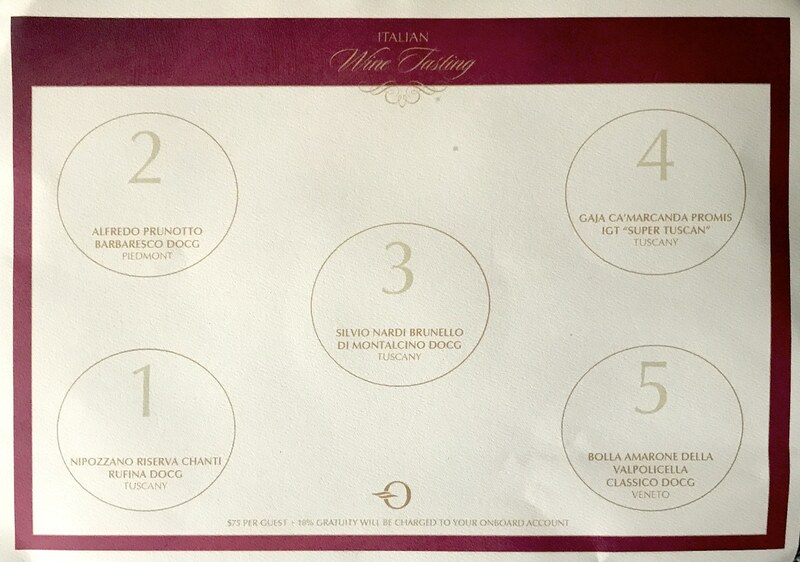 The pairing was selected to bring out the flavour of the wine. In most cases, we found the food pairing did enhance the wines. 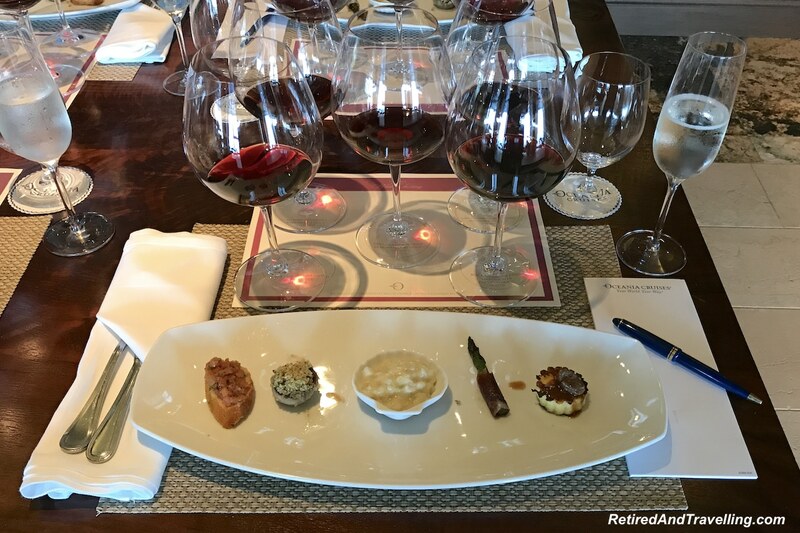 Of course, we tried food pairings with different wines to understand the difference. Everyone had a good time trying the food and wines. There were a number of sommeliers at the session. 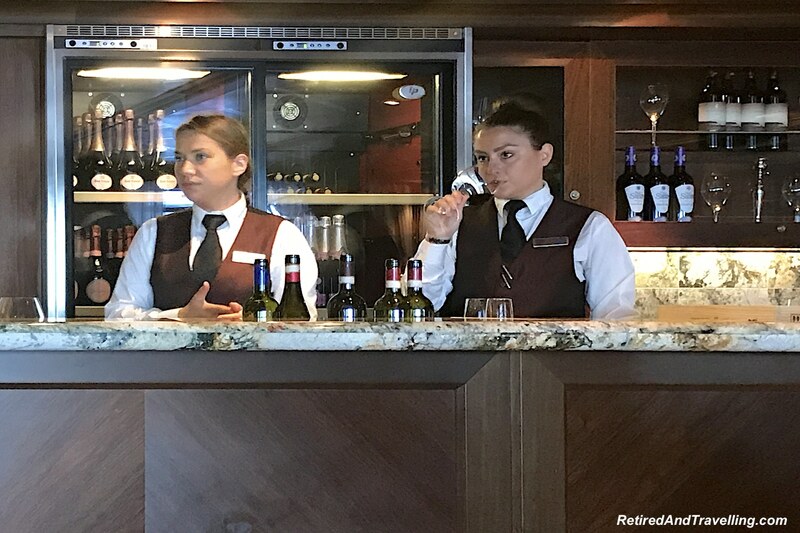 They got to learn as well at the Italian wine tasting at sea. 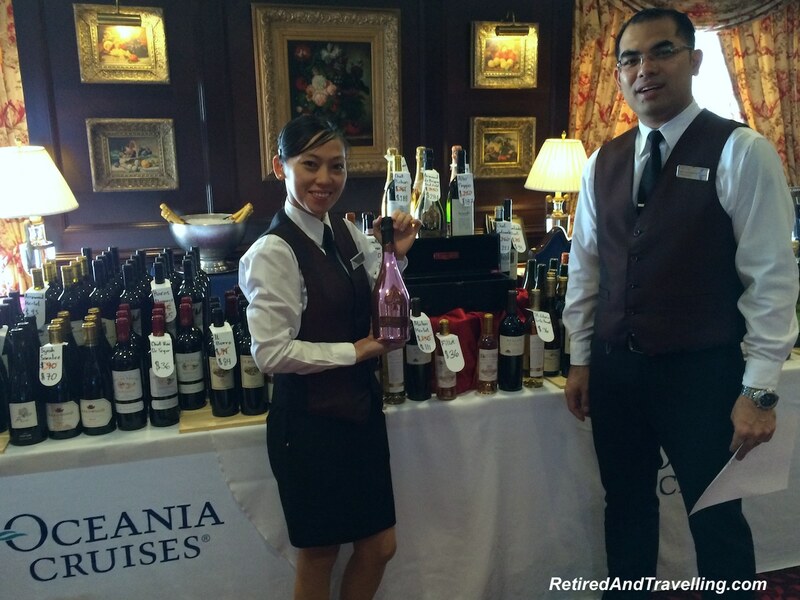 We enjoyed our Italian wine tasting at sea. I liked most of the red wines we sampled. It was less of a success for David. He really only liked the Brunello. Of course, that was the most expensive wine we tried! It was great to get to taste a wide variety of wines. It is always interesting to see how food pairings actually do make a big difference in both the taste of the wine and the food. We are excited to be heading to Portugal and Spain when we finish our cruise. This will give us two new countries for wine tasting! 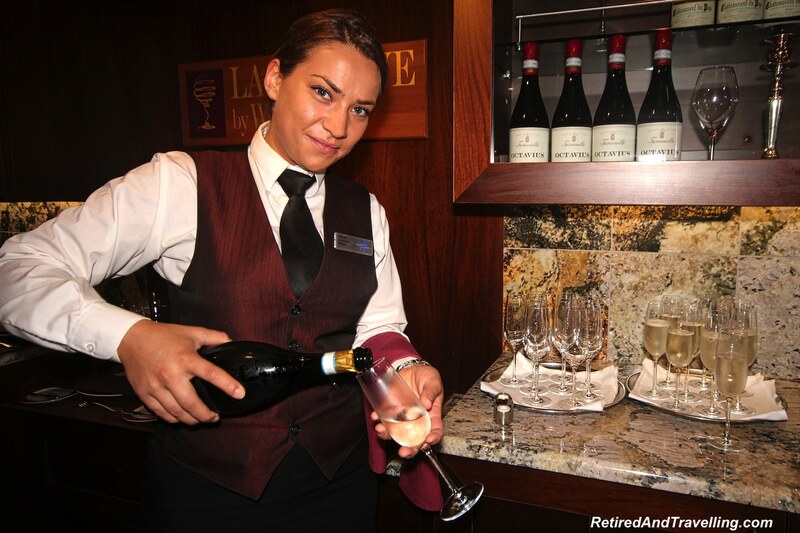 Have you tried Italian wine tasting at sea? Did you find a new favourite wine?